Click here for my blog about this piece. 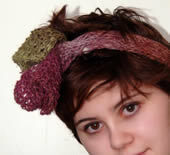 This versatile hoodie/cowl is double-sided with all the seams on the inside. 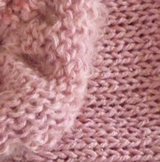 Shown here knit with two ends of a fine cashmere/mohair blend and hand-dyed in fuschia, it can be done in many different yarns or even fabrics. 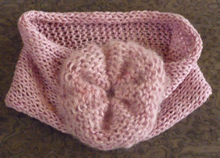 The Anna Karenina Handwarmer was inspired by the romantic heroine of the famous Tolstoy novel. 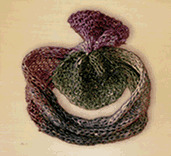 It is knit with 1 skein of Noro Kureyon or comparable Aran-size yarn and sz US 13 needles. The pattern comes with numerous pictures, a diagram and detailed explanations. 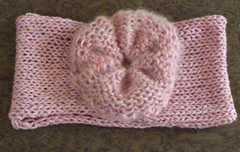 This is a fairly easy project, involving knit and purl stitches and simple increases and decreases.